What can old potato samples archived from the late nineteenth-century tell us about potato blight – a serious disease which still affects today’s food production? How can modern analysis methods help? Late blight of potato is caused by the microorganism, Phytophthora infestans, which rapidly destroys the leaves of potato crops and was responsible for the infamous Irish potato famine of the 1840s that left over one million people dead and another one million Irish emigrating. It was the foresight of two nineteenth-century plant scientists to archive potato samples from their potato blight experiment that has enabled today’s modern DNA techniques to be applied - to better understand the disease and its implications for today’s food security. Researchers, led by Professor Bruce Fitt, have the earliest proof of how this disease survived between the seasons in England and how the potato blight may have survived between cropping seasons after the Irish potato famine of the 1840s. 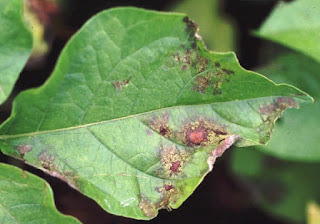 With growing concerns over food shortages and climate change, late blight remains a serious disease problem in current potato production and has also emerged as a significant disease threat to the organic tomato industry. This DNA technique is a very useful tool in plant disease diagnosis to test seed potatoes or tomato transplants for the presence of the blight pathogen. The paper “Evidence for presence of the founder Ia mtDNA haplotype of Phytophthora infestans in 19th century potato tubers from the Rothamsted archives” is published in Plant Pathology.